The average price of a gallon of regular gasoline rose closer to California's all-time high of $4.588 a gallon, increasing 1.2 cents to $4.217 during the week ended Monday, the Energy Department said. The U.S. average rose 3.5 cents to $3.879 a gallon, still short of the nation's peak of $4.114. Memorial Day fun probably won't stretch to the fuel pump this year: The relentless surge in gasoline prices means the traditional start of the summer driving season could test records set in 2008, analysts said. California drivers watched the average price of a gallon of regular gasoline climb closer to the state's all-time high of $4.588 a gallon, rising 1.2 cents to $4.217 during the week ended Monday, the Energy Department said. The U.S. average rose 3.5 cents to $3.879 a gallon, still short of the nation's peak of $4.114, according to the agency's weekly survey of fuel retailers. In Hawaii, according to a different fuel-price survey conducted daily for AAA, gasoline set a record high on Monday at $4.537 for a gallon of regular fuel. In Wailuku on Maui, the state's highest price was approaching $5 a gallon at $4.909. Independent fuel analyst Bob van der Valk said U.S. fuel prices were more heavily influenced now by the European crude oil benchmark, Brent North Sea oil, which has been trading at a premium to the U.S. benchmark on the New York Mercantile Exchange. If Brent hits $140 a barrel "it will add another 40 cents per gallon to the national average price. 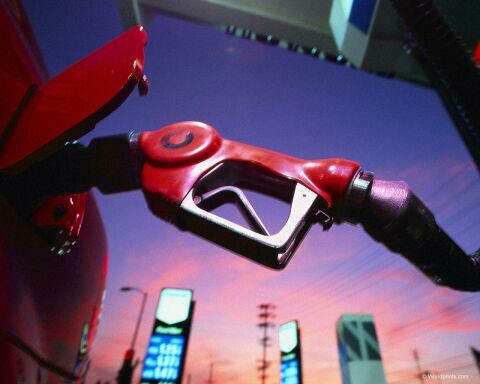 That means $4.25 per gallon for regular gasoline nationally and $5 in California," van der Valk said. Hawaii and California are among six states with gasoline averaging more than $4 a gallon, according to AAA, which uses daily credit-card receipts from more than 100,000 retail sites across the U.S. compiled by the Oil Price Information Service and Wright Express. The other $4 states are Alaska, Connecticut, Illinois and New York. Another six states are close behind with prices averaging above $3.90 a gallon for regular fuel, the AAA survey found. They are Michigan, Indiana, Wisconsin, Washington, Rhode Island, West Virginia and Nevada. Crude oil for June delivery slipped 1 cent to settle at $112.28 a barrel on the New York Mercantile Exchange, where oil futures have risen 32% this year. Brent crude lost 33 cents to settle at $123.66 a barrel on the London-based ICE Futures Europe exchange. Fadel Gheit, senior energy analyst for Oppenheimer and Co., blamed several factors for the high oil prices. "We believe the surge in oil prices this year was mainly driven by the turmoil in the Middle East, and not by rising demand or falling supply, as global economic growth remains anemic while oil inventories and OPEC spare production capacity are above their 5-year averages," Gheit said. "We believe oil prices will remain inflated by geopolitics, government policies and speculation, and to a lesser extent by supply and demand." And just as they did in 2008, consumers are beginning to respond. Auto analyst firm Baum & Associates said there had been a 46% jump in hybrid vehicle and clean diesel sales in March compared with the same month a year earlier. The change in the vehicle marketplace is so dramatic that small, fuel-efficient cars now account for about the same market share, at 7%, as "true SUVs," said Alan L. Baum, principal at Baum & Associates. Some drivers said they were going to try new commuting alternatives. Danny Metcalf of West Los Angeles said he was planning to take the bus to work next week to see if he could tolerate it better than the $4.79-a-gallon gasoline that he was pumping into his Camry at a 76 station in Santa Monica on Monday. "This is real money," said Metcalf, 32. "This is send-your-kid-to-summer-camp money when you add it all up." The fuel price spurt that began in September has some experts revising their forecasts for U.S. growth, saying that pump prices will be an anchor slowing the economy. "Economists expected that the economic recovery could withstand a gradual increase in gas prices to more than $3.50 by summer, but the sudden jump this winter and spring caused most forecasters to scale back first-quarter growth estimates from 3.3% to something in the range of 2.8%," said Peter Morici, a University of Maryland Business School professor and former chief economist at the U.S. International Trade Commission.